When you’re looking for something, you should be able to find what you need quickly and easily without needing to think about where it might be, whether it's in your email or out on the public web. That’s why this past August we opened a field trial allowing you to sign up to get information from Gmail right from the Google search box. 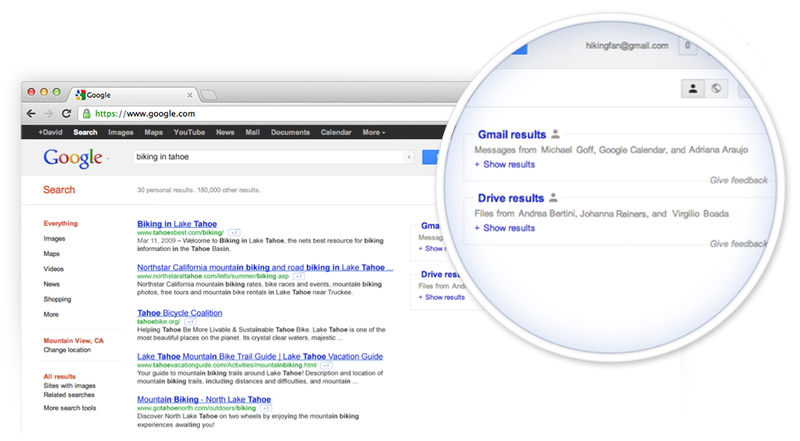 We’ve gotten very positive feedback from those of you testing it out -- such as this note: “The Gmail results feature is awesome! The fact that it's all integrated into one screen is huge.” Many testers have requested being able to find Drive files as well -- as one of you put it, “It would be awesome if I could search my google drive from google search as well :)”. So starting today, you can sign up for a new and expanded field trial that makes it easier to find your stuff across Google, whether you’re searching on Google.com or searching in Gmail. To give this a try, please visit the updated field trial page and select Join the field trial. Please note that this trial is only accessible in English and for @gmail.com addresses (not available on Google Apps accounts). And keep the feedback coming!